This product is designed to exchange heat between two liquids. Because of the double walled design, this exchanger can be used to transfer heat between potable water and a non-potable liquid. In the event of a rupture in either side, the leak path is directed to the exterior of the exchanger without contaminating the potable water. It will also not allow potable water to dilute the heating water and reduce the glycol protection. This double walled heat exchanger can be used in a radiant panel heating system for a variety of purposes. It can be used to transfer heat energy from a hot potable water source to the radiant panel or it can be used to transfer energy from an external heat source, such as solar thermal panels, to the potable water. Storage type water heaters are extremely reliable sources of heat energy: This is particularly true when used in conjunction with the Sidewinder II double walled heat exchanger, in what is called a “Combined Indirect Potable Water and Space Heating System”. This system allows the storage water heater (which, typically works less than10% of the time to support domestic hot water needs in residential applications) to safely provide both potable hot water as well as energy for space heating. Certainly there are varying qualities of storage type water heaters. Those with good quality glass linings, burners and insulation will probably outlast those of lesser quality. Nonetheless, these units will function reliably for many years with little or no maintenance. There are two basic types of storage water heaters; those that use electric resistance elements that are immersed in the tank, and those that use fossil fuel burners and a fireside heat exchanger type flue. Typically, the electric resistance type heaters are very expensive to operate if used in a large project or without some sort of discount energy program. Normally, the fossil fuel burners, such as natural gas, propane or fuel oil fired, will outperform the electric units with regard to cost of operation and reliability. Electric resistance units cost less to buy and install and can be very practical where only small amounts of energy are needed. The primary mechanism for storage water heater failure is through sediment uild up. Sediment in the potable water is carried into the water heater tank where, during stagnant periods, it is allowed to settle to the bottom. If it remains there for long periods of time it may solidify and otherwise build up to a point where the heat energy is restricted between the burner and the water in the tank. This build up causes an insulating affect, which, in turn, causes stress in the glass lining. The glass lining eventually cracks, leaving the mild steel tank vulnerable to corrosion. There are several options in prolonging the service life of a storage water heater. The first option is to eliminate sediment in terms of “hard water” by treating the potable water with a softening system. Next it is possible to prolong the life of the unit by periodically draining off the sediment in the bottom of the tank by periodically opening the boiler drain. This should be done annually at least. The third method is to keep the sediment in suspension by circulating the water on a semi-continuous basis. Of course, a combination of all three programs would offer the best solution to sedimentation. 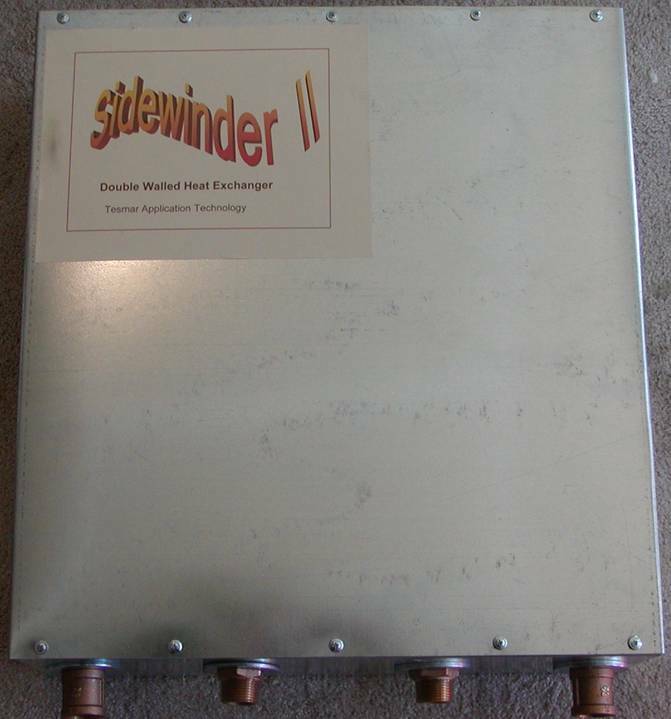 The Sidewinder II double walled heat exchanger is used to draw heat energy off of the storage water heater by use of a circulator that moves water from the tank to the Sidewinder II and back. This circulation does a couple of things. It offers some protection against sediment build up by keeping the sediment in suspension and it reduces the “stacking affect” or stratification of temperature within the tank. Stratification of heat is another failure mechanism present in storage water heaters. The temperature at the top of the water heater is often much higher than that at the bottom during stagnant periods. This means that the linings at the top endure more thermal stress than the bottom. This circulation reduces some of this stress, thus prolonging the life of the unit. Circulation also improves efficiency. When water is flowed against the fireside heat exchanger within the water heater it is able to take more of that energy off the surface and, therefore, improves thermal transfer. This process, called forced convection, is capable of improving heat transfer by a factor of 5 times or more. In heat transfer, flow is a very good thing. Your automobile radiator is a heat exchanger that exchanges the heat in your engine cooling system with the ambient air. You know that when you are waiting in traffic and little air is blowing across the radiator, the temperature rises very fast until the electric cooling fan comes on or you start moving. This is because the movement of air opposite the movement of water increases the heat transfer and improves the efficiency of the radiator. The same is true with regard to water-to-water heat exchangers. The movement of water or “forced convection” improves the total heat exchange coefficient and, therefore, increases the amount of energy that is exchanged. This, of course, is what occurs within the water heater with circulation to and from the Sidewinder II heat exchanger, where moving water improves the amount of heat exchange between the fireside surfaces and the circulating water. Some water heaters are provided with internal heat exchangers, and, although the concept is good, in practicality, the cost of these units, which are produced somewhat “Off Line”, is significant. Also, once the unit fails, for whatever reason, the entire system must be replaced. The Sidewinder II can be connected to any commonly available and mass produced water heater for a significant reduction in initial cost, and since it is a completely separate component, if the water heater fails, it can be replaced individually by anyone skilled enough to make the proper connections. Replacement would not require the services of a specialized heating contractor. General Note about Water to Water Heat Exchangers: Water to water heat exchangers work on the difference in temperature between the two fluids, the resistance and area of the heat exchange surface, and the relative flow rates of each fluid. Copper (as used in the Sidewinder II) is the best industrial conductor of heat energy. The Nominal ½ inch copper tube size (CTS) inner coil provides generous flow for the potable hot water. The nominal 1 1/8 inch outer coil provides generous flow for the heating application(s). The Sidewinder II is well insulated against cabinet heat loss. The amount if heat exchange capacity is dependent on all of these factors. If the difference in temperature between the fluids is great, the rate of exchange will be maximized. For that reason, in combined indirect water heater applications, we recommend selecting a water heater with relatively high temperature output and operating that unit at its maximum temperature setting. CAUTION: When using the Sidewinder II in conjunction with a domestic water heater for most applications, it is imperative that the water heater be equipped with an anti-scald tempering valve which blends cold supply water with the water heater hot water and provides anti-scald protection at the domestic hot water taps. (Such valves are available for sale through Tesmar Application Technology). Note: Operating a domestic water heater at or above 140 degrees F will kill all forms of dangerous water borne pathogens, such as Legionella, which, if inhaled (as in shower mist) can be dangerous or even fatal. Storage water heaters are a good place to store alternative energy, such as solar thermal or any other form of heat that is periodically available to the system. The Sidewinder II can be used to safely transfer that heat energy from that source to the potable water heater or multiple heaters, as needed. Once that energy is stored in the water heater, it can be pulled off, through the Sidewinder II, once again to service the space heating application. Sidewinder II: The Sidewinder II is a copper coil in coil heat exchange with true double walled construction throughout. It has been tested and certified to provide an industry leading leak path to the exterior with less than 2 Psi differential pressure between the fluids. It has large water pathways to provide minimal restriction to fluid flow. It includes approximately 27 linear feet of heat exchange surface at a nominal 5/8 inch radius for approximately 640 square inches of heat transfer surface. For best results, potable water and system water should be connected in a counter-flow configuration. The Sidewinder II is installed in a galvanized steel insulated enclosure measuring 20” X 22” X 6” deep. All waterway components are non corrodible copper or brass. Space heating connections are 1 inch NPT female and potable water connections are ¾ inch NPT female. Price per Sidewinder II is $617 plus shipping. Sidewinder II is available as a special order item. Lead times vary from in stock to ten days before shipment can be made. Contact me for information on availability and shipping costs. Payment must be received before shipment.